DFI-FILM | What Do People Dream About in Pine Ridge? Bert Lee, Cassandra Warrior and Lance Red Cloud, who live on an Indian reservation in South Dakota, are some of the central characters in Anna Eborn's Pine Ridge, which has its world premiere at the Venice Film Festival. "I aim to make an honest portrait that stays with us," the director says in this statement about her documentary look at the life of a group of young people on the margins of America. What’s it like to be a young person on the Pine Ridge Reservation, South Dakota, the poorest county in the USA? My basis for making a film in Pine Ridge is both political and existential. I’m not all that different that way from a reporter writing an article about people living in America today. Unlike a journalist, who generally has to stick to the factual and the historical, my intention as a documentarian is to present a series of filmic descriptions of what it means to be human. I trust what individual people tell me more than all the statistical studies in the world. I don’t do interviews – I listen, while I work creatively to find a scene that fits what I’m being told and what I want to tell others. I ask myself: What is significant here, to these specific people? What are they going to tell me? What are their dreams? What do things look like? What are their circumstances and what do they think – about themselves and about me, too? Like a poet, I’m interested in the language of cinema, the phonetics of cinema and its grammar, in the living image as a singular opportunity for unique descriptions. My attention is directed at faces, hands, relations between people, smiles, touches, nature. At the editing table it’s about getting back to the rhythm I experienced of life in Pine Ridge – a lack of structure on the part of society, young people in a kind of static chaos within the confines of a reservation, in the middle of America. My visual method shows life as it is, in a natural light, with movements at some distance but with strong feelings and details. From the first time I meet people, I listen to the sound of their voices. The words they use, the body language they speak. How do I combine the landscapes and the interiors in my characters’ lives to show their inner emotions and create a space where life and time shine through? Like a writer tells a story in words, I tell a story in the image of a face and create rhythm through body language and movements. Life is a collection of interrelating moments, and we can’t always understand or situate these moments in coherent narrative arcs. But if we insist that such moments mean everything – that even the smallest details have the greatest significance – we can gain a deeper understanding of our own and each other’s lives. Because our culture today is so influenced by American culture, I was interested in investigating parts of America that we aren’t generally confronted with but that nonetheless carry the American story. I want my film to convey the experience I had when I met these people and places – to make you think and perhaps provide an alternative perspective on the United States outside the familiar settings of New York and California. I’m aiming for something that appeals to our emotions and triggers our empathy. I’m aiming for an honest portrayal that stays with us. Cinema, like the other arts, as I see it, is about making us smarter about life. Films let us share the lonely feeling of being human among other humans. In that sense, there is no difference between documentary and fiction. Any creative work must be based on a truth from the sender, whether the sender is a writer, journalist or filmmaker. Pine Ridge is produced by Katja Adomeit and financed by Adomeit Film. The film will enjoy its world premiere at the Venice Film Festival. Director. Born 1983, Sweden. 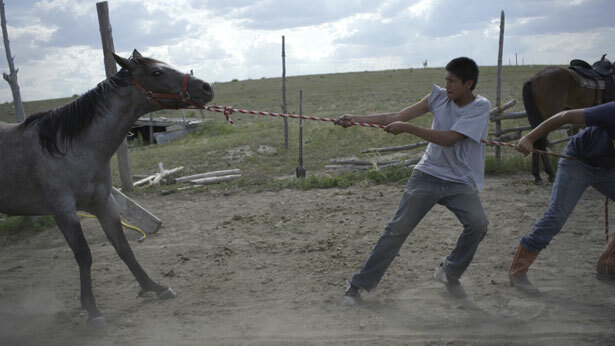 Pine Ridge is Eborn’s first feature-length documentary. Director of the short films The Brazilian (2007) and Baba (2010), which was selected for the Gothenburg Film Festival and Nordic Panorama. Nineteen-year-old Bert sits in the shade of a tree in Yo Park. Cassandra Warrior feeds her daughter, Diamond Rose. Daniel Runs Close sweats under the sun at the Wounded Knee Memorial site. Kassel Sky Little puts his boots on at the Waters Rodeo. Vanessa Piper is alone in the middle of the Badlands. Lance Red Cloud hangs out behind the gas station at night. It is summer and they all live here, on the Pine Ridge Reservation in South Dakota, USA. Pine Ridge is produced by Katja Adomeit (The Weight Of Elephants) and financed by Adomeit Film with support from the Danish Film Institute’s talent-development programme New Danish Screen. The film will enjoy its world premiere at the Venice Film Festival. An American Indian reservation: An area of land managed by a Native American tribe under the United States Department of the Interior’s Bureau of Indian Affairs. 310: Number of Indian reservations in the United States (appr.). 2.5 million: Number of Native Americans in America, of which 1 million live on reservations (2012). Pine Ridge: An Oglala Lakota Native American reservation established in 1889 in the southwest corner of South Dakota on the Nebraska border. Pine Ridge is the poorest county in the nation. Among the 30,000 inhabitants, 70% of the kids drop out of school before they finish high school, and the unemployment rate is said to be approximately 80-85%. The teenage suicide rate is 150% higher than the US national average for this age group. There are no banks, no movie theaters and no public transportation available on the Reservation. Wounded Knee: The historical site of Wounded Knee is located on the Pine Ridge Reservation and remains the symbol of Native Americans’ struggle against the US government. Two conflicts took place here: a massacre in 1890 left some 150 Native Americans dead, in what was the final clash between federal troops and the Sioux. In 1973, members of the American Indian Movement occupied Wounded Knee for 71 days to protest against the conditions on the reservation.